I’ve run marathons before. 5 times, in four different cities. But yesterday’s experience in London was the most difficult, emotionally challenging and exhausting race I’ve ever completed. It was also the most exhilarating. Running London is like running through a tunnel of well-wishers for 42.2km. 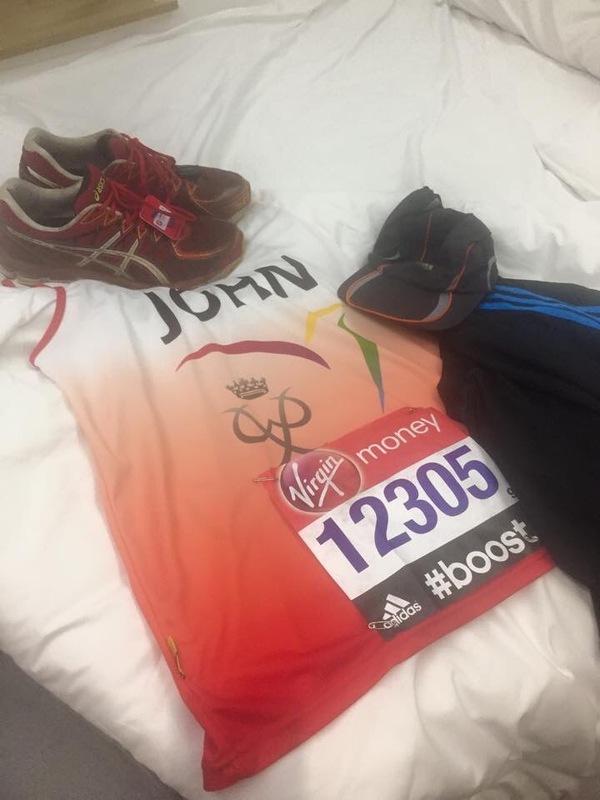 There isn’t a moment when someone isn’t shouting your name and urging you forward (assuming that, as I had, you have your name emblazoned on your shiny new running singlet.) People offer you jelly babies, Jaffa biscuits, haribos, gummy bears… Even beer. You refuse the beer. The Scouts, Cadets and running club members, who are spending the whole day handing out bottles of water at the feed stations along the route, make it seem like you’re the most important (and thirsty) runner they’ve ever met. And at the Cutty Sark, Tower Bridge and Canary Wharf, the teams of supporters from Oxfam erupt into cheers and pose for slightly bizarre selfies, when you tell them that you’re raising money for them – and why. But yesterday was special. Because of that “why”. At times whilst I was running, when normally I know my mind would drift into the comfortable numbness of the seasoned long distance runner, all I could think of was Nepal. My brain played a slideshow of images of prayer flags, the friends I’d made just a few days before, Chhepal, Nawang, Tashi, people’s houses in Khunde and Khumjung, the monasteries, little dry stone walls. And those thoughts made me cry. And they kept me running… Or walking, if you spotted me in Poplar. As I write, more than £2,300 has been pledged online by more than 150 friends (and some strangers too) to support Oxfam’s disaster relief efforts. This generosity is extraordinary. This afternoon, I received an equally extraordinary offline pledge of a further £5,000. One of the social media tags for this year’s event was #handinhand, commemorating the two finishers of the inaugural London Marathon 35 years ago. Yesterday and today, more than a hundred and fifty of you have held hands to support the people of Nepal. Thank you, thank you, thank you. I may run another marathon. But there will never be another race like London 2015. That’s just made me cry. Thankyou for running and making my Nepal donation mean something to someone here – I have not been (yet – bit busy with Peru) but it is on my list. Maybe one day we’ll meet in a DofE capacity!